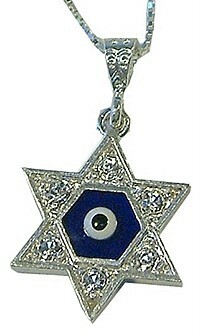 An exquisite Karams 3/4" Star, approximately 3.5 gr Pendant combines blue color genuine Evil Eye Bead and Sterling Silver . All Karams jewelry are handcrafted by Master Jewelers and individually inspected. All Karams jewelry are hypoallergenic and come jn a beautiful gift bag. Other Evil Eye "Good Luck" designs, bracelets, earrings, rings, pendants and decorative items are available. The evil eye is the name for a sickness transmitted by someone who is envious, jealous or covetous. In Hebrew it is called "ayin hara" (the evil eye), Greek "mati", Spanish "mal ojo or el ojo", Italian "jettatore", Persian "bla band", Turkish "nazar". Almost everywhere the evil eye belief exists and protective charms and spells used against the evil eye. In Greece, Turkey and Israel many patterns of apotropaic charms have been developed. Personal jewelry (bracelets, anklets, pendants, necklaces and many more) decorated with evil eye have become very popular and fashionable. Other decorative pieces like Greek and Turkish blue eye amulets, religious icons, blue beads with horseshoe, camel, elephant, Israeli and Arabic eye in hand amulets, hamsa hand amulets with or without crescent have become very popular in North America. Karams have very wide selection of the Evil Eye Jewelry, Amulets and Decor available at very reasonable cost.